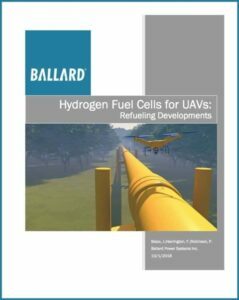 Ballard Power Systems, a leading provider of innovative clean energy solutions and fuel cell technologies, has released a whitepaper outlining the current state of fuel cell technology for unmanned aerial systems (UAS) as well as the economics and logistics of providing hydrogen to drone operators in the field. There are a variety of hydrogen storage and refueling solutions for PEMFC (proton-exchange membrane fuel cell) powered UAV systems, with each approach providing distinct benefits for particular UAV mission requirements and budgets. To find out more, download the whitepaper from Ballard’s website.